Supports cognitive function and facilitates communication between neurons. 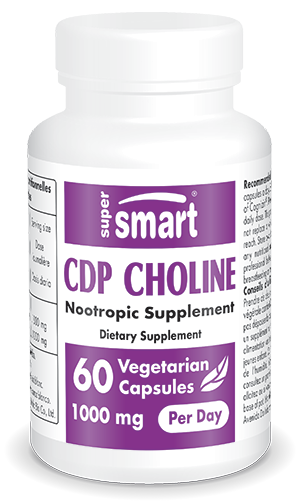 ¤ CDP-choline has been studied, with varying results, for its ability to accelerate recovery in patients suffering from post-traumatic coma and in those with ischemic and thrombotic problems. ¤ Its neuro-protective power makes it an excellent supplement both for treating chronic cognitive decline associated with ageing and as an adjunct treatment for Alzheimer's and Parkinson's disease. In animal studies, CDP-choline inhibited neuronal degeneration induced by the damaging beta-amyloid protein which is found abundantly in the brains of Alzheimer's patients. Other ingredients: magnesium stearate, silicon dioxide, microcrystalline cellulose. Cognizin®, Kyowa Hakko, Japan. Each vegetarian capsule contains 250 mg of cytidine 5-diphosphocholine (CDP‑choline). People over 40 can take two to four capsules a day to optimize performance or as a preventive measure. Those who need to can take four to six capsules a day, on the advice of their therapist.